Manila – Fishing vessels registered in the Philippines, Indonesia and Cambodia have been filmed “laundering” illegally caught tuna, environment activist group Greenpeace International said on Thursday. Greenpeace said it recorded the transferring of skipjack and yellowfin involving four ships just outside Indonesia’s exclusive economic zone in the Pacific Ocean on Wednesday, with the tuna likely meant for the canned market. Two Indonesian vessels and one Philippine ship were transferring their hauls on to the Cambodian boat so that the location of their catches would remain secret, according to Greenpeace oceans campaigner Farah Obaidullah. “This is a huge trans-shipment, the hold [of the Cambodian vessel] was the size of a basketball court and it was knee-deep in tuna,” Obaidullah said. Obaidullah was speaking by telephone from aboard Greenpeace’s MY Esperanza, which has been sailing through the Pacific looking for illegal fishing activities and is continuing to follow the Cambodian-registered ship. Obaidullah said the practice of transferring tuna from one vessel to another in international waters was a common way for companies to hide their illegal fishing in various countries’ exclusive economic zones. “They skirt in and out of the national waters into the high seas [international waters] to launder the fish,” Obaidullah said. She said foreign vessels typically went into the waters of a small Pacific island country and illegally fished there. In the case documented by Greenpeace, the captain and crew of the Cambodian-registered vessel allowed them on to their boat but said they had no log books to show where the fish came from. 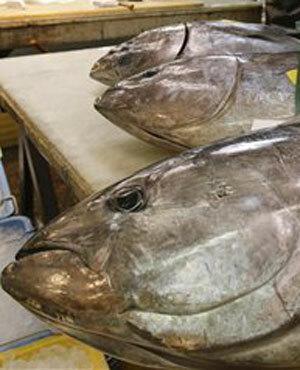 By transferring the fish onto one vessel, it is easier to transport the illegal catch to a port and avoid scrutiny. Obaidullah said one way to combat the problem was to ban fishing and transferring of catches in the so-called high-seas pockets of the Pacific Ocean, and for governments to set up enforcement activities in those waters. Greenpeace will be lobbying government to agree to close the high-seas pockets at the Western and Central Pacific Fisheries Commission’s annual summit in Manila in December. More than half of the tuna eaten around the world is caught in the Western and Central Pacific Ocean, with rampant overfishing destroying the stocks, according to Greenpeace.